As you can see, among other things I'm selling Eternal belt buckles. No, I'm not a blacksmith. No, I did not buy some underpriced belt buckles to relist them. What I'm doing is buying materials for the buckle (around 55G), find a blacksmith, who create 10 buckles for 30-50G (3-5G/each), and sell the buckles for 95-100G. This means around 40G profit on each buckle. And I'm selling a lot. What I'm doing now is the WoW equivalent of owning a factory. The owner buys the materials, hire hourly payed workers to do the work, and sell the product. If product price > material price + worker salaries, the factory is profitable. the BS would not have 30-50G (unemployment). While he could buy the materials himself, craft the buckles and sell them himself (therefor acting as a small business owner), for some reason he decided not to. He may not have money for the materials of a single buckle, he may afraid that they don't sell, but most probably he has no clue about how profitable it is. Anyway, for his own reasons, he has chosen not to craft them himself, so the only way for him to make some money from buckles is being a payed employee in a buckle factory. A businessmen seeks material supply (cheap saronite) and product demand (expensive buckle), and invest his own money to build a factory to connect these points for the good of all. His profit comes from this useful work for the society. If his profit is "unfairly" huge, it's because he lacks competitors. If someone else would decide to also produce belt buckle, I would have to undercut him, decreasing my profit. Since I have to find a blacksmith, while a blacksmith doesn't have to find himself, I have an innate handicap against a blacksmith-businessmen, therefor if a blacksmith would decide to produce buckles in a larges scale, I'd be out of business in no time. But until it happens, I keep on having huge profit on buckles and others. And you can have it too! Of course you can have a "factory" in other professions too. All you have to do is find a skilled payed employee, buy materials and sell products. checked on my server costs 38g to craft currently and they are listed starting at 85g a piece. My guild mate is a BS so I'm gonna talk to him about setting up shop w/ me. I agree with you as long as ppl don't have to pay for food/roof/doctors because when they do profit takes on a darker shade... ofc where the line is drawn on reasonable and unreasonable I have no idea. Im with cloaknpoke, may see if one of my lovely guildies will do the honers maybe once a week. One of my RL best friends is a BS so ill grab him. I've been able to clear about 5-10g only from buckles. There's quite a bit of competition out there on my server. And I can only sell about 3-6 a day. I haven't done it for a while. Still, this is a reminder to check back and see what the market is doing occasionally, especially given that the JC market has crashed big time. I need something to do with my saronite. I'm with cloaknpoke, love this blog and the simple economy. Will have to look into these niche items and make some Ferengi's profit. Well this is great, tried it out today. Alrdy made bout 100g but i still got about 2k coming in, shud have sold by tomorrow. With this money ill just get more and more buckles reselling them almost 2x cost of mats and fees. I just ask on Trade "looking for BS" and they link. If i have mats i only get aroun a 1-2g fee for each. Tehy Sell 100g on my server but its sure to drop through undercutting. Ugh. 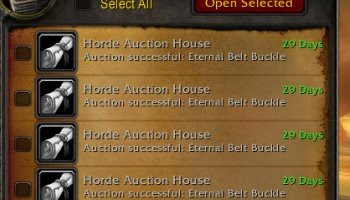 If no blacksmiths are making the belt buckles themselves to make profit, I have to wonder what is wrong with them! Of course there is nothing wrong with you having them made and selling them instead. Those buckles are great! I have bought a couple on my AH already for about 95g each. It's crazy that no blacksmiths were already profitting on them when it's obviously an item people would want. I agree with your principles, but you really need to learn more about Marx.